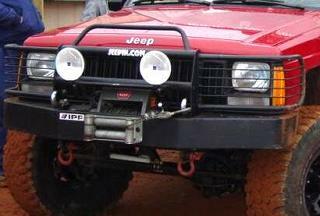 Designed for especially for Warn winches, our winch bumper fits all XJ's, both '84-'96 XJ's and '97-'01 XJ's. 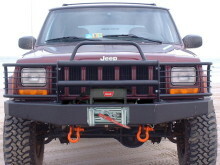 Shown with optional wrap-around brush guard, euro-bar hoop, and bolt-on shackle mounts (all sold seperately). A cover plate is also available if you're not installing a winch right away. All parts are powder-coated black.